Transforming a body of text into corresponding mathematical expressions and models is traditionally viewed and taught as a mathematical problem; it is also a task that most find difficult. 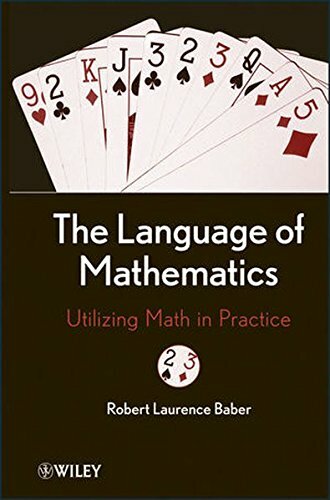 The Language of Mathematics: Utilizing Math in Practice reveals a new way to view this process—not as a mathematical problem, but as a translation, or language, problem. By presenting the language of mathematics explicitly and systematically, this book helps readers to learn mathematics¿and improve their ability to apply mathematics more efficiently and effectively to practical problems in their own work. Using parts of speech to identify variables and functions in a mathematical model is a new approach, as is the insight that examining aspects of grammar is highly useful when formulating a corresponding mathematical model. This book identifies the basic elements of the language of mathematics, such as values, variables, and functions, while presenting the grammatical rules for combining them into expressions and other structures. The author describes and defines different notational forms for expressions, and also identifies the relationships between parts of speech and other grammatical elements in English and components of expressions in the language of mathematics. Extensive examples are used throughout that cover a wide range of real-world problems and feature diagrams and tables to facilitate understanding. The Language of Mathematics is a thought-provoking book of interest for readers who would like to learn more about the linguistic nature and aspects of mathematical notation. The book also serves as a valuable supplement for engineers, technicians, managers, and consultants who would like to improve their ability to apply mathematics effectively, systematically, and efficiently to practical problems.